Originally written for New Mandala under the title “Indonesians are not idiots”. Interesting comments @ the original post. As Prabowo Subianto’s messianic nationalism chomps through rival presidential candidate Joko Widodo’s once-unassailable lead in Indonesia’s opinion polls, New Mandala and other fora have flared with concern. Prabowo is a thug, they say (though a lot more politely); he will shut down democracy, he will take Indonesia back to the bad old days of autocracy-in-the-name-of-stability. If he’s elected, he may well do exactly that. But here’s the thing: on election day, July 9th, Indonesia will still be a democracy, and a pretty robust one at that. Prabowo will only be able to exercise his nefarious plans if he is elected. The hand-wringing should, therefore, be a lot less about Prabowo’s intentions, and a lot more about the intentions of the 187 million Indonesians who are registered to vote. I’m a lot less qualified to wring my hands than most of the commentators on New Mandala; for one thing, I have not been in Indonesia since late 2013, and have thus missed all the latest twists and turns of publicity, campaigning, and distribution of largesse, the sorts of things that influence what people say to pollsters. To me, however, the disparity between the opinion polls and the electoral results in previous elections in Indonesia suggest that the hoopla of campaigning does not affect people’s voting behaviour in quite the same way. At campaign rallies (at least the local ones I’ve attended in many provinces) Indonesians speak of handouts, prizes and inducements; they rate contestants by the quality of the food on offer. (For the record, the best I came across was provided during a 2012 visit to Gorontalo by President Susilo Bambang Yudhoyono’s son Edhie Baskoro; I counted 24 different kaki lima food vendors offering all-expenses-paid dishes of many types. The Democrat Party also used the early morning rally to give away electric fans, microwaves, smartphones and a motorbike.) But in private, on the back verandah of a fisherman’s cottage in the Banggai islands, roasting coffee beans in a kitchen in Aceh, or while collecting fiddle-head ferns for supper near a longhouse in Kalimantan, people use different words about the way they vote: ikhlas, hati nurani, murni, sejati: the words of conscience, or purity, of I’ll vote with my brain not with my free T-shirt. I spoke to several thousand “ordinary” Indonesian voters in over a year of travelling some of the further-flung parts of the country in 2011/2012, at the length that is permitted (indeed enforced) by a five day ferry journey or a week celebrating a relative’s death. Jokowi was a new kid on the block then, but Prabowo was already a well-known quantity. People admired Prabowo for being tegas — firm or resolute, in its kinder translations. The most enthusiastic admirers — principally in deeply hierarchical Java — muttered approvingly about his “iron fist”, and some went so far as to say that Indonesia needed a firm leader. But the final verdict was almost always: “Sayangnya, sih Prabowo suka melanngar HAM”: The problem is, Prabowo abuses human rights. Politicians will all do dubious deals with large corporations or rich donors, voters appear to reason, they will all steal money one way or another. But they will not all steal your dignity. Indonesians have had enough of that. Prabowo has run a slick campaign, it’s true. Nearly two years ago, I was already seeing his team parking ambulances plastered with his image and slogans including “Free Medical Care” outside the tombs of saints in outer islands to advertise his virtues to passing pilgrims. Meanwhile Megawati Sukarnoputri has done all she can to undermine her candidate Jokowi’s chances. Megawati has a peculiar talent for snatching defeat from the jaws of victory; she did it in 1999, before Indonesian voters were allowed a direct say, and again in 2005. Jokowi has not managed to limit the damage that PDIP infighting has done to his chances — that should raise concerns about how well he will do in the bear-pit of national politics. So it is still possible that Prabowo will indeed triumph. But I don’t think it is likely. As Prabowo himself has said, Indonesians love their democracy. For all the bitching and moaning about corruption at the District/Municipal (Kabupaten/Kota) level, most Indonesians outside of Java have no desire to see their affairs controlled once again by a small clique of presidential cronies in Jakarta, and most voters know that Prabowo will claw power back to the centre if he can. 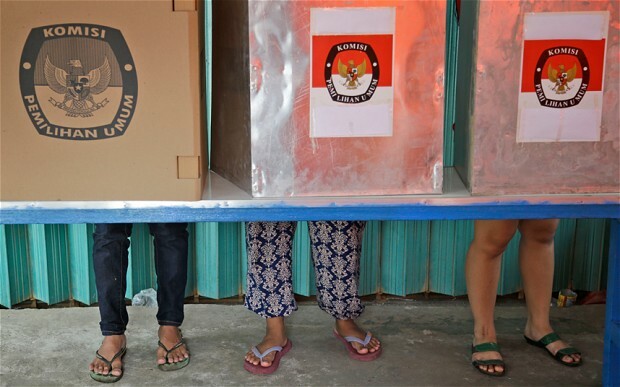 Indonesians are getting a lot more sophisticated about their democracy, too (as they should be, with a minimum of seven direct elections in any given five-year cycle to practice on). As I noted in an essay in Foreign Affairs, they did not allow the interests of national parties to trump their own immediate interests in April’s legislative elections. They are likely to defend their own interests in the presidential election as well. Indonesians have a choice and they know it. In my experience, they are not as easily swayed by nationalist bluster and Sukarno wannabe rhetoric as many commentators fear. If my faith in the basic common sense of the Indonesian electorate is misplaced and a majority of voters choose Prabowo, well, the Indonesian people will get the government they deserve. 1 Comment on "[I really hope] Indonesians are not idiots"
your hope ” indonesian ” is not idiot showing that you are an arrogant ! by saying some one who do not match with your hope is idiot ?